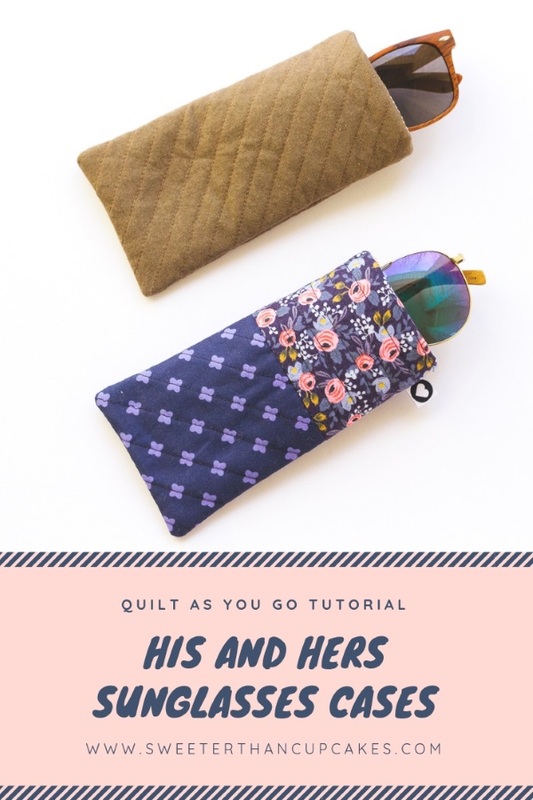 Want to take my quilt-as-you-go sunglasses case tutorial to the next level!?! Add a super sweet label! I purchased these labels with a store credit provided by the shop, and Dutch Label Shop is offering you a discount as well. Use coupon code sweeterthancupcakes15 for 15% off your order. The coupon code is valid for 60 days. I do not receive any commission for these sales. The labels I received are wonderful, and I hope you have the chance to incorporate some in your work as well. As soon as I received new labels from Dutch Label Shop, I knew I needed a quick project to highlight them. The side seam tags are my absolute favorite!! Won't they be a sweet addition to the side seam of one of my daughters' dresses!?! That's a lot of exclamation points. I'm just excited to have visible evidence of the love I sew into each garment I make for them. I used the center fold tag option in the Dutch Label Shop and made sure to note the direction of the heart for a side seam label. The other tag I ordered was for me alone. I have a few "Sweeter Than Cupcakes" tags, so I thought a tag reserved for myself would be fun. Since becoming an Aunt, my family nickname became Coco. So much more classy than "Court" don't you think? To create the design for the tag, I used Canva's free logo templates. So simple! My husband is often fielding questions about whether I sew for him. I did make him boxers ages ago, but I admit I don't regularly sew for him. I figured a solid brown chambray sunglasses case would be manly enough. The coordinating lining just happens to look a bit like eyes. I couldn't pass that up! To keep the case on the masculine side, but still tag it with some love, I put the heart tag inside the case lining. Now he'll get a little reminder each time he reaches for his shades.